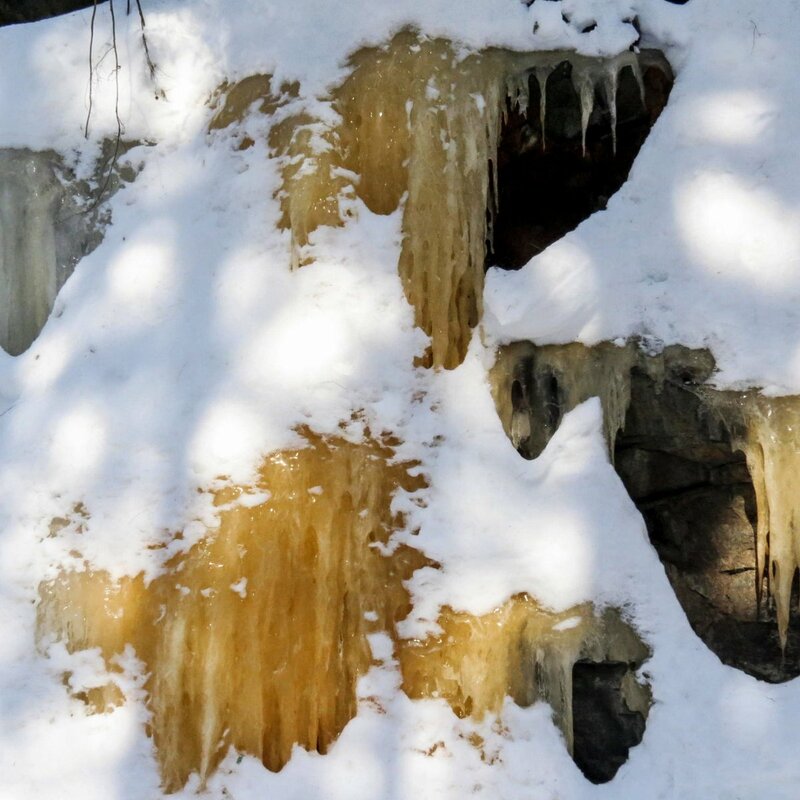 If you’re tired of all things winter then this post isn’t for you because it’s about being in a freezer of sorts; a man made canyon blasted out of solid rock where seeping groundwater freezes into icicles that grow to the height and diameter of tree trunks. I visited this place last week because I thought that, since this was just about the coldest February that we had ever seen, I’d be able to see some big ice. I wasn’t disappointed. I think this is the biggest “icicle” that I’ve ever seen. 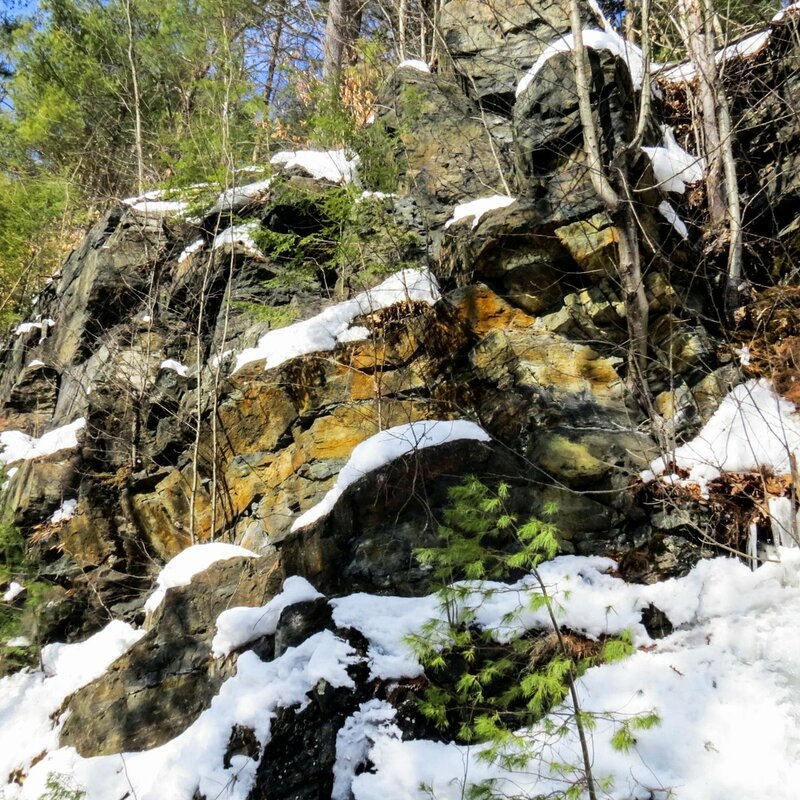 It had to have been 15-20 feet out from the rock face and 40-50 feet tall. 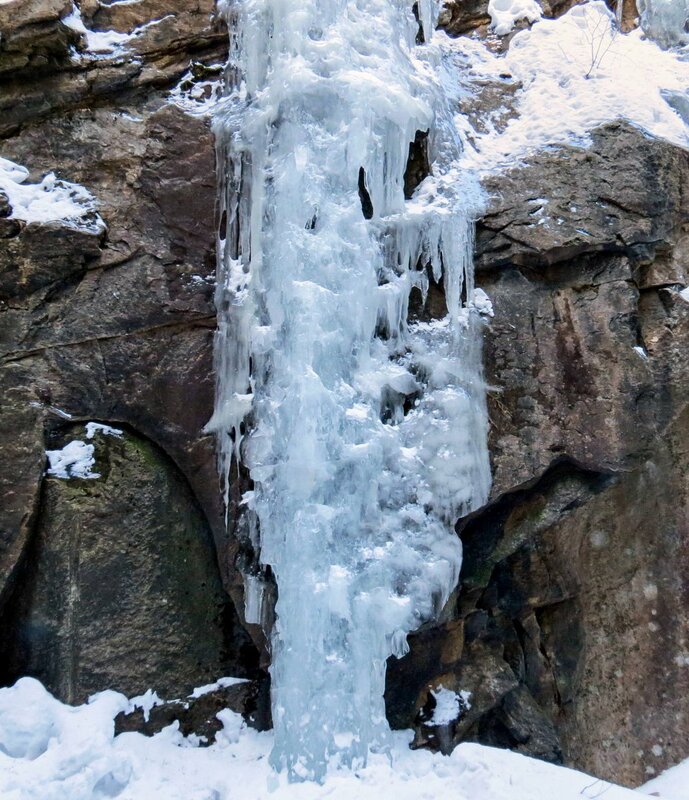 It is the sweetheart of the ice climbers who come here and, if you look carefully at the very top of the photo, you can see the legs of two ice climbers dressed in blue who were tying off their ropes, preparing to climb down this monster. Right beside the green ice in the previous photo was this black / brown ice, which I’ve never seen here or anywhere else before. I’d guess that it was either soil or minerals that gave it this color. Note how the snow below it looks dirty. You can see colored stone all through this place and, though some of the color comes from lichens and algae, much of it is from minerals like iron that leach out of the soil. Many of the mineral stains are orange but some are yellow, red, green, and very few a light blueish gray color. The last time I came here I saw this orange ice for the first time, and by now it had tripled in size. The orange mineral stain on the stone face in the previous photo was very near this spot, so I’m fairly certain that iron must be staining the ice. My favorite color is the blue ice, and this was the bluest ice I’ve ever seen. 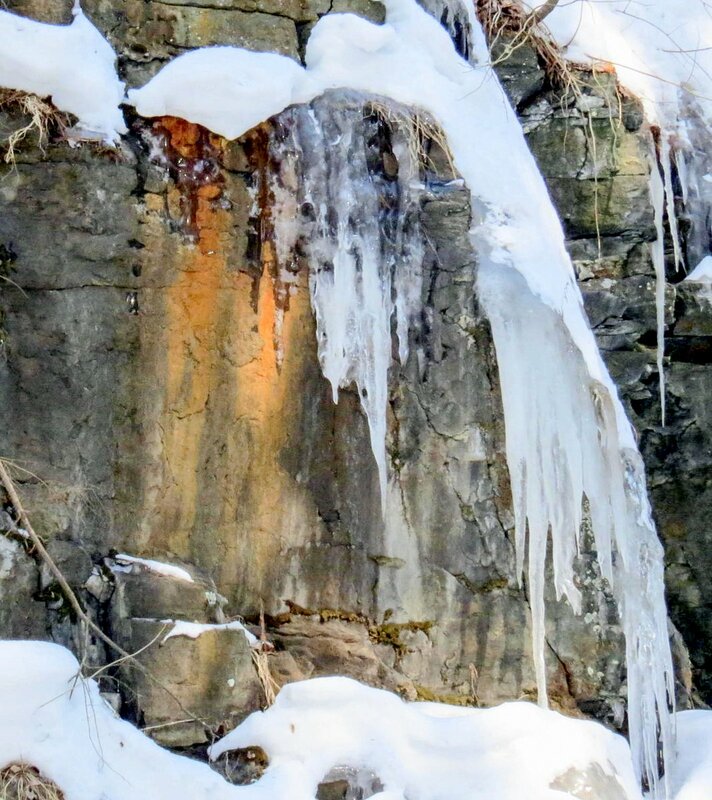 There was water running down the rock face behind this ice column and it was as noisy as a rushing stream in spring. I’ve heard that blue ice is very dense and that its color comes from the way certain wavelengths of light are absorbed by it and others are reflected by it. It seemed as if you could pick a color and there it would be, frozen into the ice. 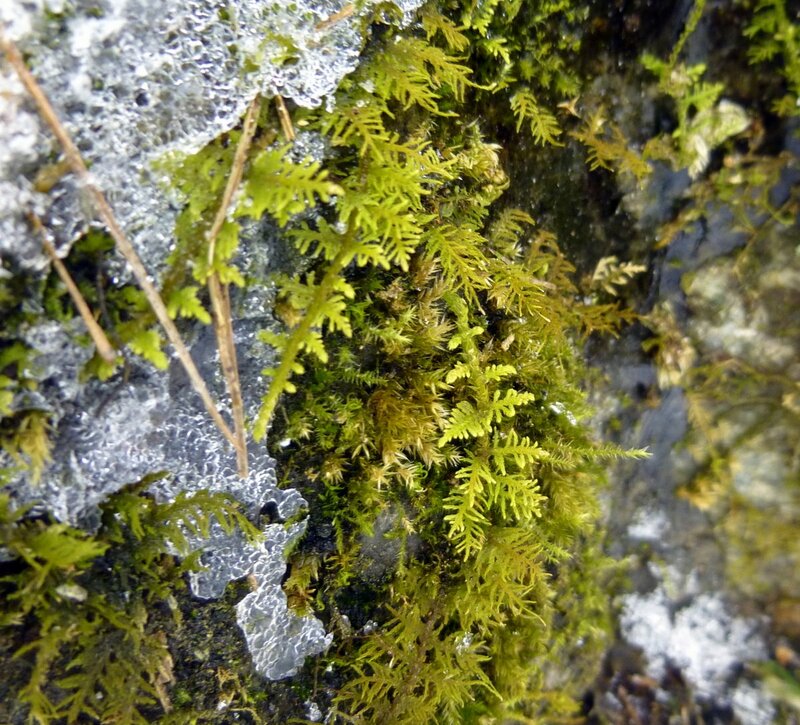 It also seemed like the ice had covered all of the mosses, liverworts and every other growing thing that lives here. There were still small islands of green to be seen here and there but I didn’t see any liverworts. You wouldn’t think that moss with a name like delicate fern moss (Thuidium delicatulum) could grow in a place like this but there it was. Maybe it’s not quite as delicate as its name suggests. 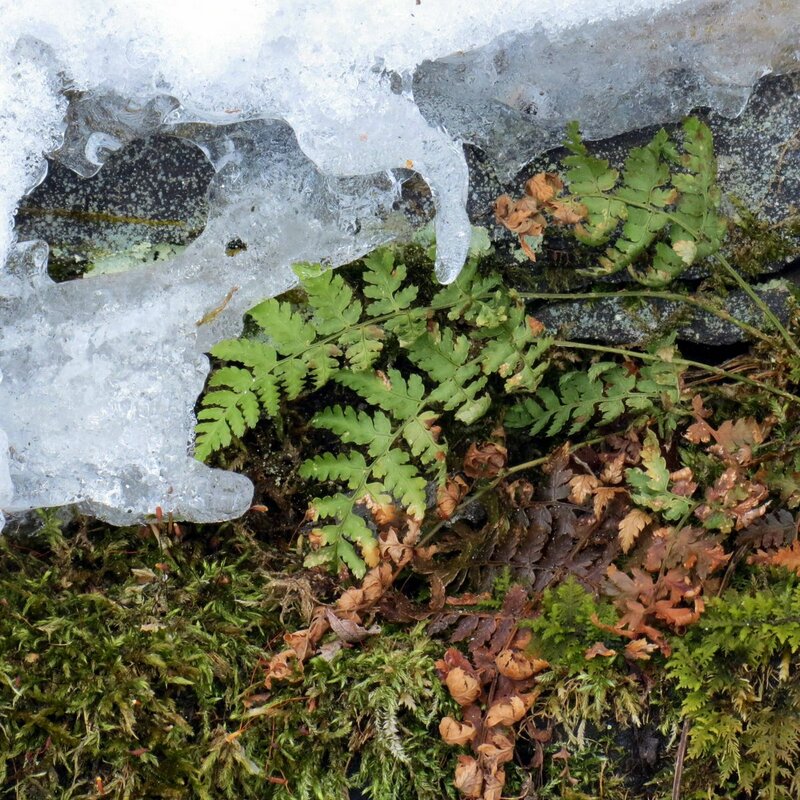 Ferns too could be seen peeking out from under the ice. I think this one is a spinulose wood fern (Dryopteris carthusiana,) which is one of our few evergreen ferns. It likes lots of water. In the summer almost every inch of these vertical walls is covered by some form of green, living thing. They must all be quite tough to survive essentially being frozen inside of ice for the winter. 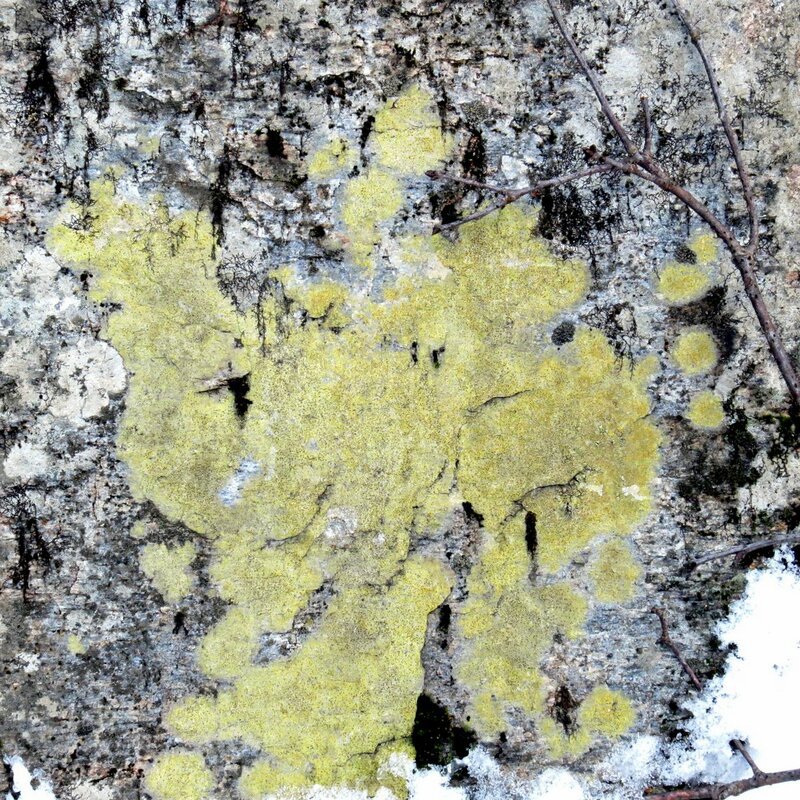 I saw a few interesting lichens but I couldn’t get close enough to them to know what they were. Typically in winter there is a good 2 to 3 feet of snow on the rail bed, and if you add that to the foot or so depth of the ditches from dry ground, it’s quite a drop. Getting down into them isn’t too bad but getting out can mean a crawl in the snow. I was surprised to see that the ditches weren’t frozen over in many areas. As cold as gets in this place I can’t imagine what keeps them from freezing. 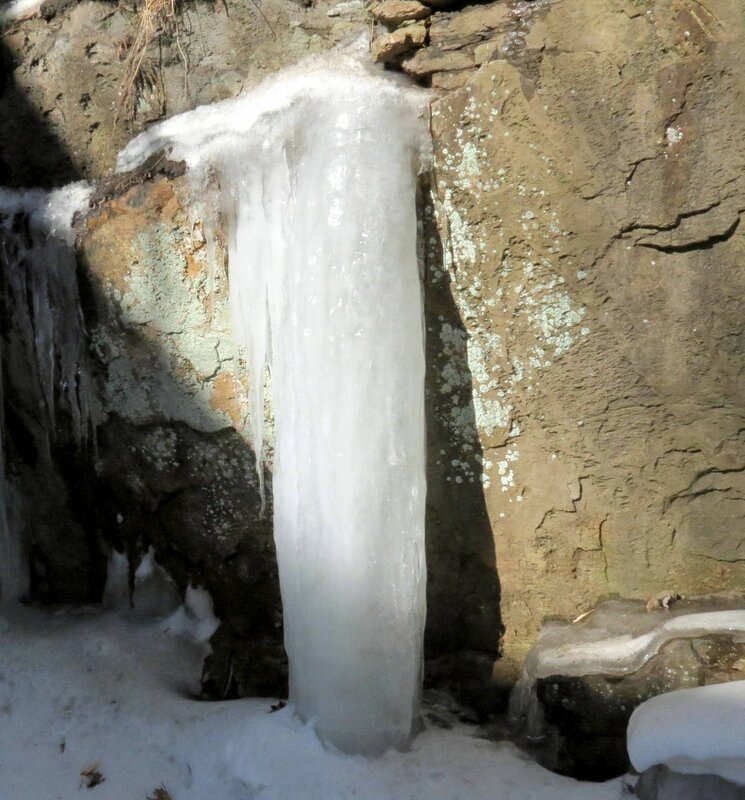 I saw one ice column that looked like someone had sculpted it into a real column like shape. It was taller than I was. It was easy to see how groundwater seeped from this diagonal crack in the stone face. When you think about the water that froze and expanded inside the crack it’s not hard to understand how Ice can tear stone apart. It’s starting to slowly warm up a little now, so I’m not sure that it’ll be a good idea to come here again until the ice has melted. 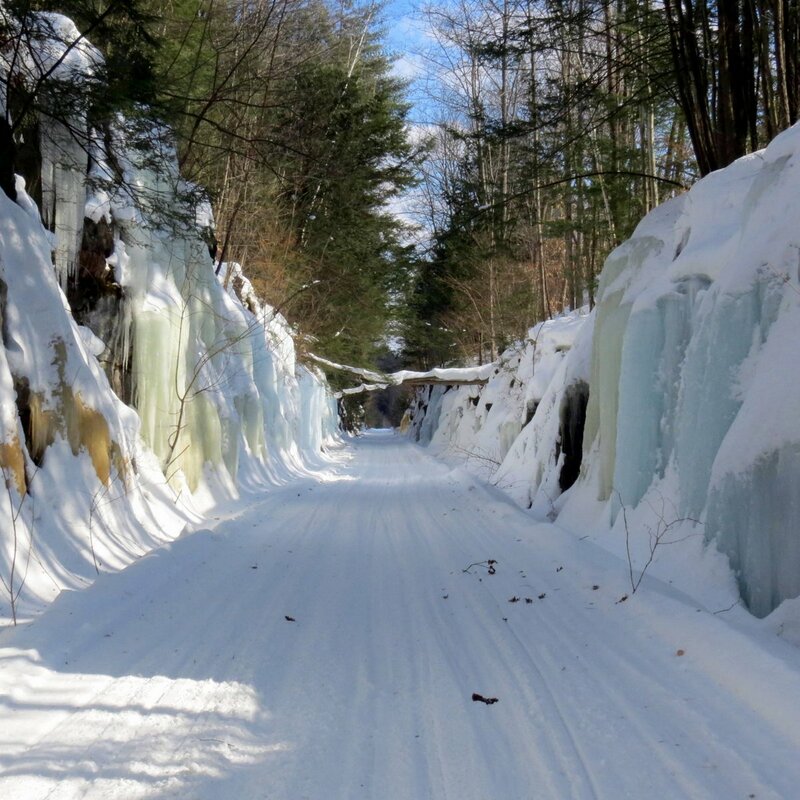 These ice columns are tall enough to cross the entire trail when they fall and are easily heavy enough to crush a person, so this is a good place to stay away from when the ice starts rotting. 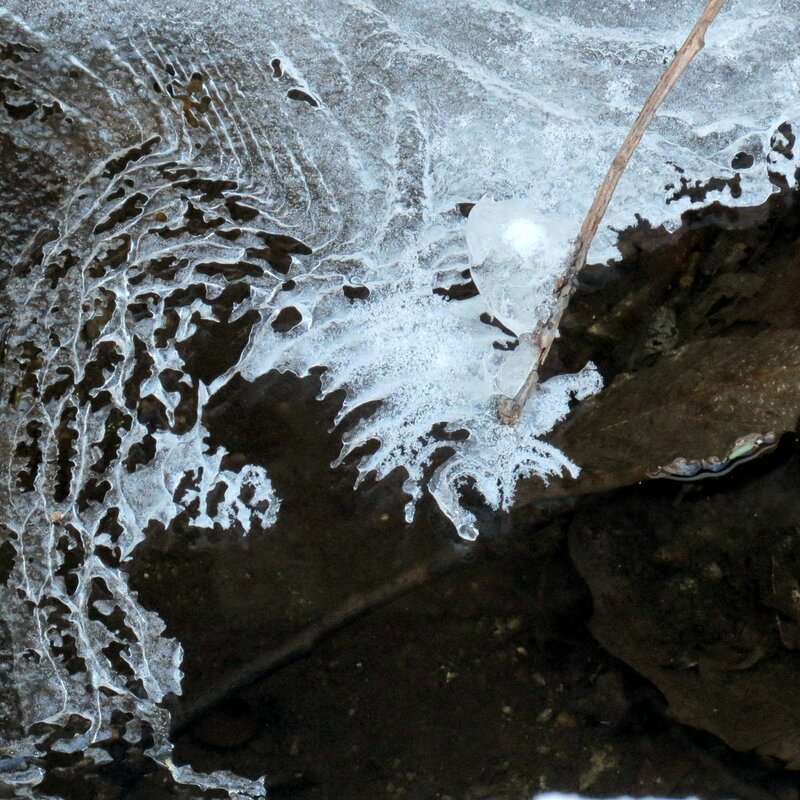 I saw a few ice formations in sunny spots that were already rotten. For those who aren’t familiar with rotten ice; when ice rots the bonds between the ice crystals weaken and water, air or dirt can get in between them and cause the ice to become honeycombed, and to lose its strength. You know that clear ice is rotten when it turns a milky grayish-white color, looks to be full of small bubbles, and has a dull sound when it is tapped. Thank you Irene, I’m glad that you liked them. What a wonderful place but so cold. It reminds me of some of the caves I’ve visited filled with stalactites and stalagmites. That’s what it’s like there, and it can be very cold! Thanks Martha. Yes, it did feel like we were frozen into the ice for a while there! It is difficult to describe my favourite photograph so will just say that it is the fourth from last. Such beautiful patterns! Thank you Susan. I thought you’d like this post! I know you like ice. Thank you Eddie. That could be true; I can’t think of anywhere else where I can see ice like this! Thank you Agnes. Have a great week! That sure turns into a beautiful piece of real estate with the very cold weather! 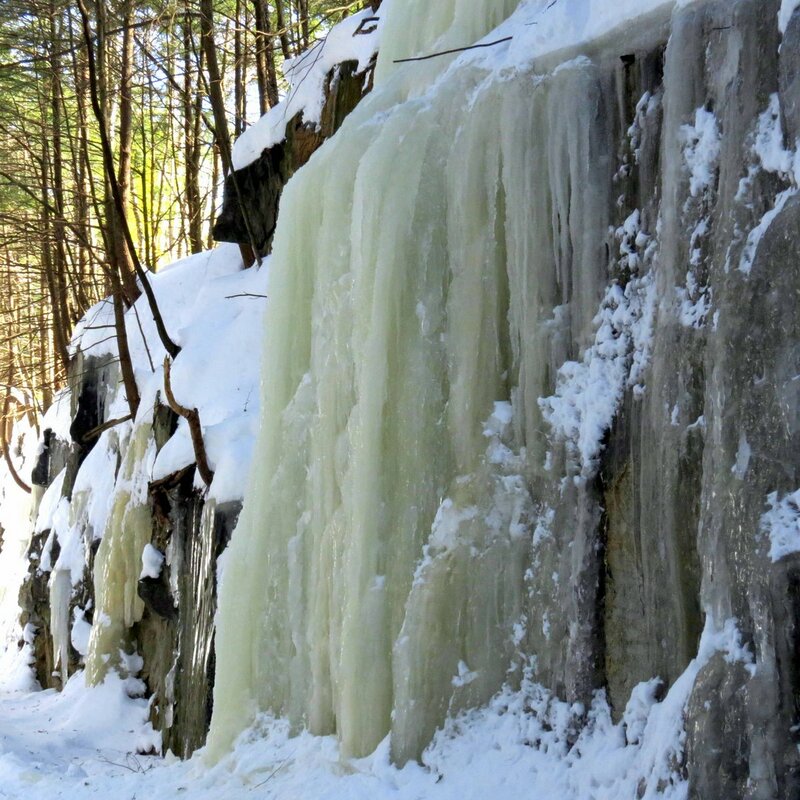 If it could be done from a safe enough distance, it would be quite an experience to see some of the ice fall! I’ve thought the same thing-I’d like to see it and hear it fall. The trouble is you don’t know where it will fall and there’s nowhere to hide once you’re down in there. 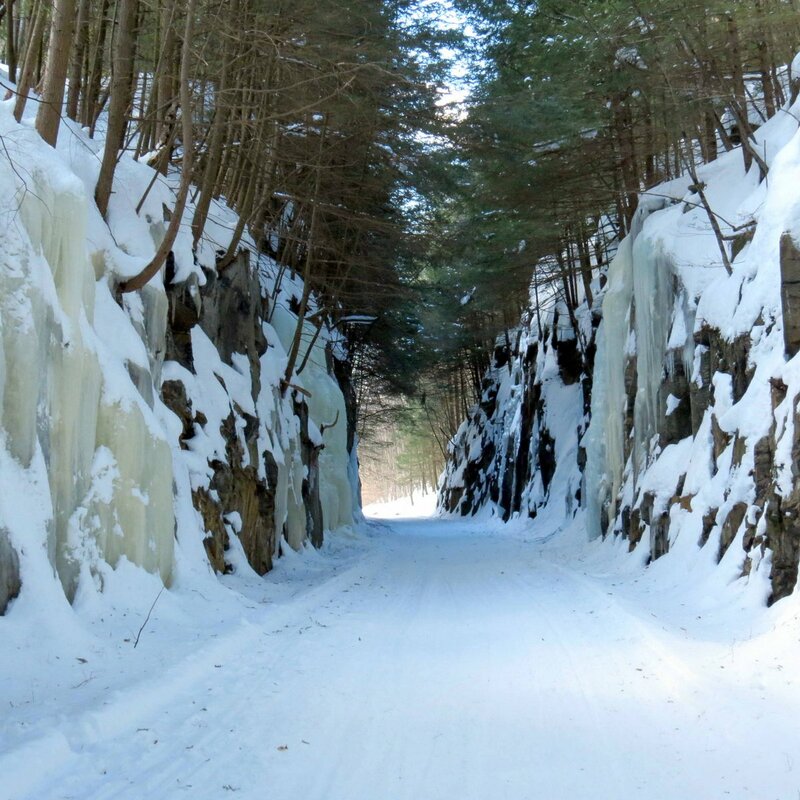 It’s only about as wide as a standard railroad bed in the deepest part of the cut, so you’d want to be a fast runner! Interesting! I’ve never noticed how icicles can be stained by minerals and soil. I never did either until I saw what was going on here. It must happen in other places but I’ve never seen it. Those are indeed very impressive icicles. At least your severe cold gives you some interesting things to look at (and show us). Yes, these are by far the biggest icicles that I’ve seen. I thought that it would be a shame not to show people what a little cold can do. Wonderful! I have learnt so much about ice from you. I had never realised before that there could be so many types and colours of it. I knew it could cause damage to roads and buildings but it hadn’t occurred to me that it could split rock. Thank you Clare. Before I found this place I never knew that ice could be colored like this either. This is the only place I’ve ever seen it have so many different colors. 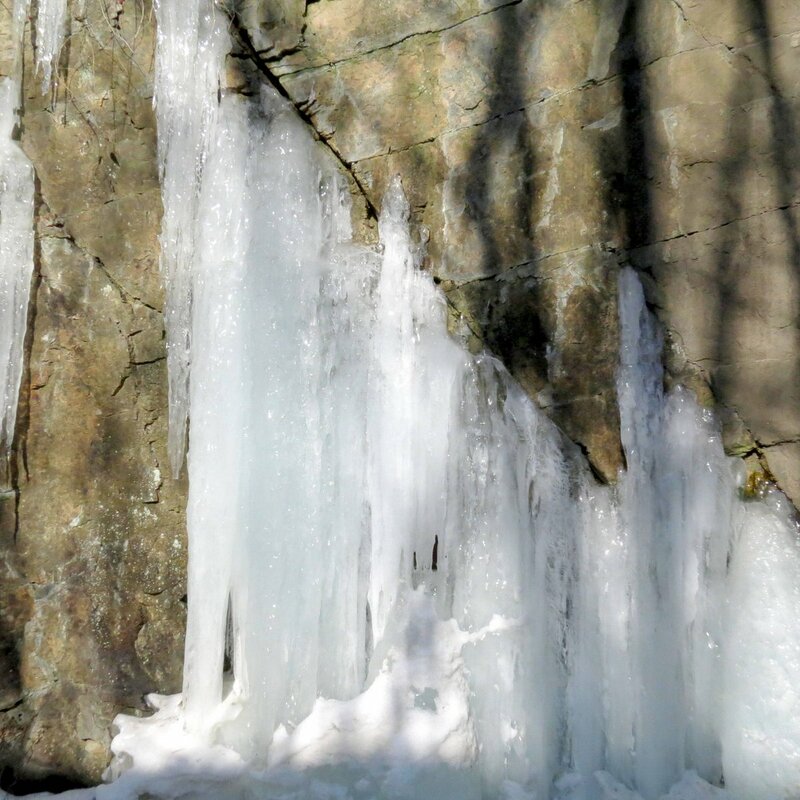 Ice can do some amazing things, including splitting rock. It’s what pulverizes our mountains into sand in this part of the world. Amazing to see the sheer size and variety of the ice – you guys certainly have had it cold. I imagine that this canyon will be off limits until early April for safety’s sake! Thank you Matt. Yes, I’ll stay out of there until at least then. 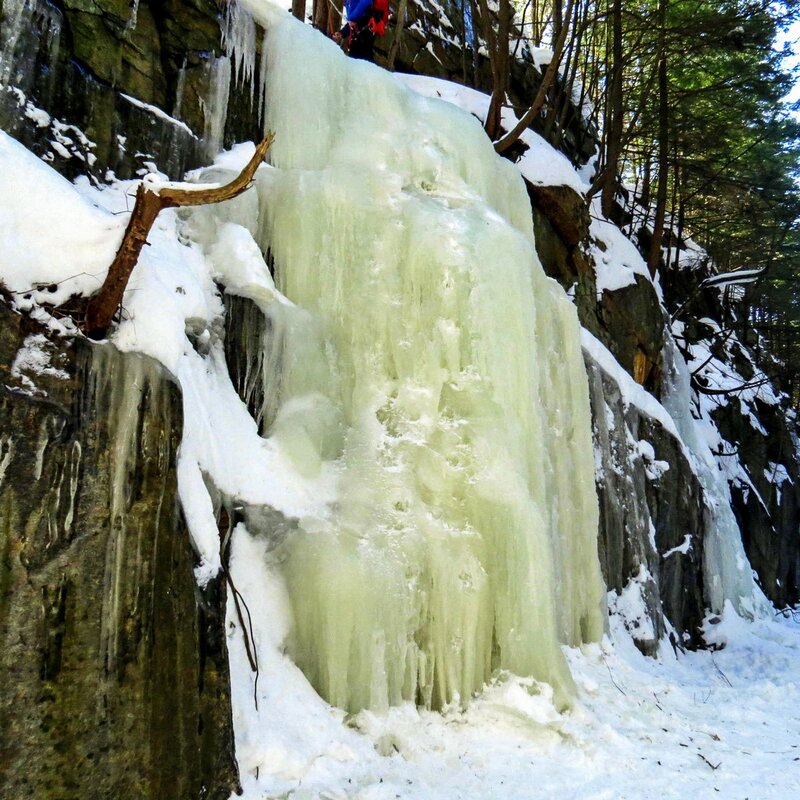 I’ve seen some pretty big chunks of ice lying in the trail! A vicarious hike was just what I needed today’s weather. I particularly liked the colors of the ice. That’s something we don’t see around here. Thank you. We really don’t see much colored ice here either. Mostly just in this spot. I think there are a lot of minerals in the soil there for some reason. I will never tire of your winter photos, you always mange to show the real beauty of it all. 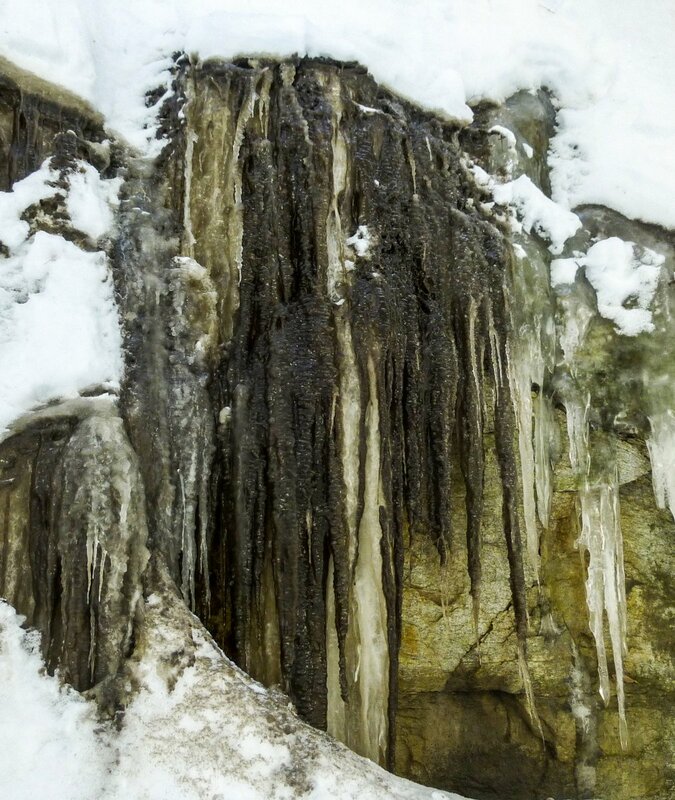 The ice columns are stunning and glad to read your are standing at a safe distance! Thank you Julie. I think that’s because I look for the beauty in it. It isn’t hard to find and I wish more people would look too. No, I don’t get too close to the ice, especially when it starts to warm up. We’re up to 45 degrees F today! Nature is indeed wondrous, from the way that the plants survive being frozen in ice to the colors and shapes that the ice takes on, I can see why you return here so often. Thanks Jerry! The ice actually melts surprisingly fast and I think it must have something to do with the almost constant breeze that funnels through this place. Once warmer air starts blowing through it doesn’t take long. This place is really one of a kind in my experience. I’ve never seen ice like this or the plants that grow here anywhere else. It’s a source of endless fascination and surprise, so I have a hard time staying away for too long. Ho-lee! What stunning photos. And who was to know that there’s such a thing as ‘rotten ice”? Glad those ferns have found a way to thrive. Thank you Cynthia. Yes, ice can rot when it warms enough. I’m always amazed by all the plants that grow there and yes, nature sure is grand! Thank you Carole. It’s a cold place, so I’m not surprised. It’s amazing to see all of the different shapes that ice takes as water seeps and flows and solidifies. Fascinating posting, Allen, though I confess that I am more than ready for spring and feel the need to put on more clothing right now after seeing your images. Thanks Mike! It does get pretty cool down in that canyon so you would want to dress for it. I’ve left there shivering several times! I’m ready for spring too. We got a dusting of snow last night but we’re already up above freezing, so spring is happening. It is where I live. Thanks for the re-blog Bob. I love the blue ice, especially as seen in your post as I read it from sunny AZ. Winter does have its beauty, but I’m glad I missed it this year! It looks like most of the blue ice is on the right side of the canyon, I wonder if it has anything to do with the amount of sun it gets. Thanks Laura. Yes, you picked the right winter to be somewhere else! Sun could play a part in how dense the ice gets, I would think. I’d guess that the sower it formed the more dense it would be and since blue ice is supposed to be the most dense, it would make sense.